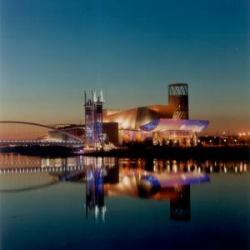 I’ve just returned from my first ever Health Libraries Group conference in Manchester, well, Manchester was in the conference title, although we were told in no uncertain terms from a local that the conference location The Lowry is in fact in the city of Salford. I admit at first I was a bit concerned this was going to be too NHS-y for my job, but there was more than enough that was relevant to academic libraries, although I didn’t meet many folk who weren’t employed by the NHS. I doubt anyone wants to read a summary of all of the sessions I attended especially when you will soon be able to download the presentation yourself from the conference website, so I’ve made a summary of points that caught my eye. You can also read the tweets from the HLG conference searching under #hlg2010. Two very different messages came from two presentations on teaching information literacy to nursing students and practicing nurses. Mark Raynor & Alison Brettle from the University of Salford showed us the results of their study comparing the effectiveness of face to face training sessions with training that was entirely online. They found no difference in the results or skills retention of both groups, although a vocal minority just did not like the elearning approach. I admit in general I would rather learn something from a person telling me than from online instruction, and I’m convinced I remember more. Whether that’s just a personal preference or an illusion that I remember more is another matter of course. That could just be me slipping into pre web 2 mode. If online learning is well designed and it’s a process you follow through rather than just a list of instructions then perhaps its just as good. Tatjana Petrinic from the University of Oxford spoke about how the popularity of their generic training for nurses (in practice not students) had fallen off, but that 1 to 1 training was very popular – to the point that they no longer have to advertise it, nurses contact them for training. This has developed into supporting nurses to publishing. They cover literature searching, referencing, complying with the journal style. Nurses don’t get this kind of advice elsewhere and Tatjana said as a group nurses are very supportive of each other in the process (compared to other professions which will remain nameless). I think where done well, face to face training can offer more support for people who are unconfident and who prefer a more human approach. In reality where there are large numbers of students involved well designed elearning can do the job very well, but I can’t help thinking it always helps if you have a friendly face you can ask. What are librarians good for? Two thought provoking presentations by Lyn Robinson and Andrew Booth , whilst very different, came to the similar conclusion that its not so much ‘technical’ skills such as information retrieval that librarians can offer which is unique, as an approach to seeing the bigger picture to facilitate the flow of information and knowledge either across organisations or from creator to user. Andrew Booth started with the memorable finding made by Paul Glasziou that the longer doctors practised the less effective they were (they don’t keep up to date? ), and had wondered whether this could also apply to librarians. Are the experienced over confident and novices under confident about what they can do? Another perhaps less surprising observation Andrew found in the literature was a study that concluded that more experienced staff (not necessarily librarians or doctors) tend to have a more ‘passive implementation of the curriculum’ than novices, in other words they are less inclined to innovate (I presume that’s what is meant). I’m not sure a total novice is always keen to innovate, unless they are completely foolhardy, but perhaps there is somewhere in between. Reinforcing the original point about the use of librarians was Emily Hopkin’s presentation on how she set up a library service (or rather an information service) with no physical library or stock at NHS North West. She went about all the informal ways of gathering information about the organisation going to meetings, talking to people in corridors, finding out what was going on. She discovered all sorts of places where people had information needs she could help with. Unsurprisingly she found people had little understanding of what a library service is beyond books in a room and that asking people what they wanted was not the most fruitful approach. To show what she could do she sent them information she knew they needed based on her ‘spying’, and before long they were sending her requests for more work. She found the thing people most wanted was for her to do internet research where they simply don’t have the time or they want a more comprehensive search. This sounds like great practice; going to grass roots to find out what people are actually doing , and providing a valuable service they never knew they could have. Its just as relevant to academics libraries as anywhere else. I think us subject librarians could learn a lot here, in particular with supporting research or even supporting not only the academics but all sorts of administrative staff. Of course we have known all this for years, but implementing it seems to be another matter. I had a similar job for PricewaterhouseCoopers (doing internet research / enquires for their staff and writing summaries, briefings and current awareness bulletins), and that was over 10 years ago. Critical Appriasal teaching: Michelle Madden showed us her excellent wiki for supporting librarians teaching critical appraisal. She had surveyed attitudes to teaching CA and found three quarters of librarians think they should teach it, but despite the majority having had training that only one third actually do train others. There were some organisations barriers to this, but often it was down to lack of confidence in knowledge of statistics and medicine. She has set up a support wiki CATNiP – Critical Appraisal Tookit Navigating into Practice which includes lots of support material include preappraised articles. I’ve requested access to this site, which I hope I get as it all looks very useful. The Health Informaticist and collaborative blogging: Alan Fricker and Hanna Lewin talked about their experience of producing their collaborative blog The Health Informaticist. Unlike our very own collaborative blog, the four writers come from different settings within health information (a charity, hospital library, governmental body and a private company). Perhaps we could claim though to have very different specialisms even if we all work for the same organisation. It was interesting to see another very different collaborative blog in a related field of interest. On a purely trivial note I did think to myself its time we improved the look of our blog – unless the strictly functional style is what we prefer. Thanks HLG I enjoyed this event. There were lots of useful practical things I could take away, and that’s not just the free pens and post-it notes.